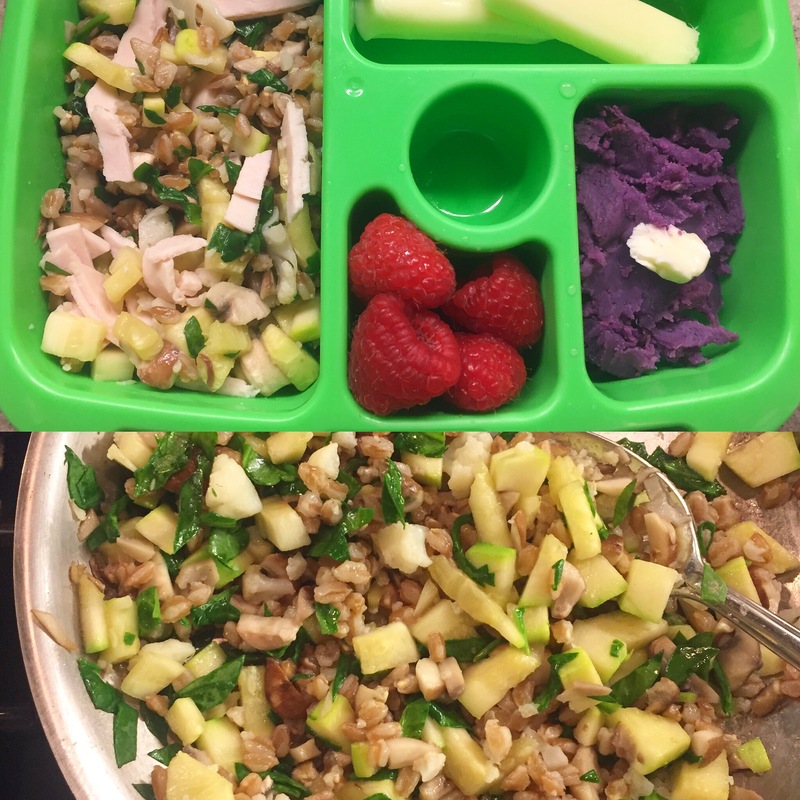 What: A fast Veggie and Grain blend to help you switch up one of your many parental responsibilities – keeping school lunch exciting! The key is to make your grains ahead as I do each week – one big batch to use in lunches, salads, dinner sides. Grains even freeze well after cooking. Some favorites are: Farro, Barley, Bulgur, Wheatberries, and Quinoa. When: When you and your little one are sick of making and eating sandwiches every day, serving protein atop a grain and veggie bowl is a great way to deviate from the norm. I’ll tell you more about how your child can easily to transport your creation to school, alongside some other exciting options to make lunch fun, healthy and colorful. Why: We don’t serve too many cold cuts, a school lunch staple, in our house. This is because it’s hard to find good quality lunch meat that is without potentially dangerous Nitrates and Nitrites. I also prefer to buy Organic Cold Cuts where possible (which is not to say that we don’t cheat once in a while). While there are good options for Organic Lunch Meat, many brands still use fillers such as Carageenan, an ingredient that is non-nutritive and brings with it several health concerns. All these things considered, Grains and Veggies topped with a Protein are a great alternative to the omnipresent sandwich. When I do manage to find a Cold Cut brand that satisfies all my usual requirements (Plainville Farms is my current fave), it will always, and unfortunately, have a higher price tag attached to it. Sure, maybe I’ll throw together a sandwich or two with it, but serving sliced Lunch Meat atop a grain bowl is a nice way to mix things up but also stretch the ingredient! Grain and Veggies are super filling and will give your little one a nutritional boost when they need it most. In a skillet over medium flame, melt a pat of Butter and add Zucchini and Mushrooms. Cook, stirring, until tender, turning the flame down if needed. Once veggies are tender, add the Minced Spinach and stir. Finish by adding Grains and heat through. Melt one last pat of Butter and add Salt and other seasonings as desired. To serve, top with sliced Cold Cuts or other protein (last night’s dinner leftovers make a great option too!). Tip: We absolutely love our Bentgo Kids Lunchbox. I recommend it to everyone (they’re also available on Amazon). The lunch boxes are BPA free, and they come with a removable, microwaveable tray, for easy heating, serving and cleaning. If you can, buy a spare removable tray. This will allow you to prepare two lunches at a time leaving you ahead of the game on busy weekdays. Here’s to fun and healthy lunch.